A collection of exclusive high-end properties in Kolkata, which includes lavish flats and apartments in Kolkata from the best developers of Kolkata properties like Godrej Properties, Mani Group, Orbit Group, etc. in some of the most premium Kolkata property locations like Alipore, Ballygunge, etc. Get details of highend flats and apartments in Kolkata with latest information and price trends that makes your Kolkata property purchase a completely hassle free experience. with price trends and local informations. Whether searching for a home or an investment opportunity in Kolkata real estate, our user friendly resources like google maps, property filters, e-brochures, apartment floor plans, digital photos makes your property buying even easier. Earlier known as Calcutta, Kolkata is the capital city of West Bengal and the third-largest urban agglomeration in India, with a population exceeding 15 million. Kolkata was once capital of British India. At present, Kolkata is the primary hub of business, commerce and finance in eastern India and forms the ideal base for industries ranging from IT to manufacturing. It has also earned a reputation as the intellectual and cultural capital of India. The city features an international airport (Netaji Subhash Chandra Bose International Airport), a major river port and a metro rail, and is connected to the rest of the country by 4 national highways, and two major railway terminals at Howrah and Sealdah with a third, Kolkata Station, as a new hub. The city also headquarters two major divisions of the Indian Railways -- Eastern Railways and South Eastern Railways. Its twin city, Howrah, lies across the Hoogly River. Kolkata is home to India's first metro rail that connects the north-south ends of the city in just 45 minutes, and features a vast network of roads and suburban railway that links one part of the city to others. Kolkata is slated to get the country's first elevated light rail transit system. The project will be completed in four to five years. The East-West Metro Corridor has also been approved. This is a Rs 4,676 crore metro rail connection between Howrah and Salt Lake in Kolkata, part of which will run under the Ganges. Development will be taken up in two phases and completed in six-and-a-half-years. The city has undergone major transformation over the past few years with the IT sector growing at an amazing rate of 70% every year. Major projects to develop the city's infrastructure have been taken up by the government and new roads, flyovers, bypasses, over bridges, under bridges, etc are being added to ease traffic congestion in the city. The Eastern Bypass, AJC Bose Road Flyover and Kona Expressway in particular have improved connectivity markedly. The West Bengal Government is making ample effort to develop the city's infrastructure and bring Kolkata at par with cities like Bangalore and Hyderabad. Eastern India's first city, Kolkata has held to its status as the region's primary commercial and financial hub, in spite of a slowdown in the recent past. Kolkata today is marked among the country's fastest growing cities with a booming industry in IT and other upcoming industries. This, combined with the improved lifestyle, has created major demand for Kolkata property and giants from the industry are responding to this by parking their investments in the city's growing realty market. Not just residential, but also the retail and commercial sectors are experiencing significant rise in Kolkata property scenario. Although Kolkata has lagged behind other metros in the country in recent years, the real estate market in the city is considered far more stable than those in the other cities. Kolkata real estate has accordingly caught the notice of investors, looking to make long-term and low-risk investments. With IT related developments coming up in areas like New Kolkata Township of Rajarhat, Salt Lake, VIP Road, E.M. 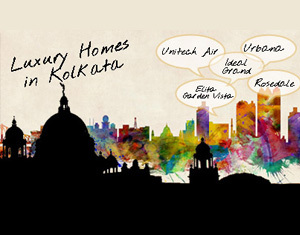 Bypass, etc, these have become some of the most in-demand locations for properties in Kolkata. Extension of the Metro and Bypass to Garia have also opened up areas extending up to Narendrapur. The streaming of Foreign Direct Investment in to the city has also led to the increase in real estate demand and the subsequent appreciation in property prices. Residential property rates in these areas range from Rs.2000-Rs.5000 per sq feet, with expected appreciation of 50-60% over the next 5 years. Commercial spaces in Kolkata, Residential Land in Kolkata, Plots in Kolkata, Apartments in Kolkata, Flats in Kolkata, Office spaces in Kolkata, Retail space in Kolkata from reputed builders/developers of Kolkata by our qualified real estate agents with extensive experience in Kolkata properties. Thanks for showing your interest in . Please register in the form below and our sales team will contact you shortly.